*This is part two of a two-part series. Read part one here. In 2008, Brett Kavanaugh authored an extraordinary law review article specifically describing his views on the separation of powers – extraordinary because all of his suggestions expanded the power of the executive branch at the expense of the other two. The executive branch has never been stronger and never been so unchecked by the other branches, but to Kavanaugh – and to the man who has nominated him to be a Supreme Court Justice – it's never enough. Kavanaugh and his fellow "unitarians" believe the Constitution vests the president with direct and unbridled control over every single instrument of executive power -- including the Justice Department and law enforcement. Unlike the justice he would replace, Anthony Kennedy, Kavanaugh would be the fifth solid vote providing Trump with the legal justification to exercise the monarch-like authority that his tweets so clearly show that he craves. Kavanaugh made five suggestions in his 2008 article. The first one has already been widely discussed: "Provide sitting presidents with a temporary deferral of civil suits and of criminal prosecutions and investigations." Another was to "Ensure prompt Senate votes on executive and judicial nominations." And in a further attempt to cripple Congress's ability to advise and consent, he also declared that "the political ideology and policy views of judicial nominees are clearly unrelated to their fitness as judges, and those matters therefore appear to lie outside the Senate's legitimate range of inquiry." Kavanaugh's third suggestion was to "Streamline executive branch organization and ensure that officials in independent agencies are more accountable." Their independence "may weaken the Executive and strengthen Congress's hand in the Washington power game," he wrote. It also has "clear costs in terms of democratic accountability". And what Kavanaugh considers accountability is accountability to the president, not the public. Kavanaugh endorsed the late Justice Robert Jackson's framework for determining the legality of national security decisions: Category One is when Congress has authorized the president's actions and his authority is "at its maximum". Category Two is when Congress has neither authorized nor prohibited the action and presidents operate in a "zone of twilight". Category Three is when Congress has prohibited an action and the president's power is "at its lowest ebb." But Kavanaugh wrote that the courts shouldn't take anything other than explicit, specific Congressional prohibition as triggering Category Three. "As a matter of judicial restraint and proper statutory interpretation, courts should be careful about finding a commander-in-chief case in Category Three based on implied prohibitions alone," he warned – taking an obvious swipe at the high court's landmark 2006 Hamdan ruling, which curbed the Bush/Cheney White House's assertion of nearly unlimited executive power in a time of war. Kavanaugh did not quote Jackson's language about how in Category Three, "what is at stake is the equilibrium established by our constitutional system." Instead, he described that condition as when "the President asserts his preclusive and exclusive commander-in-chief authority." Civil libertarians like David Cole, national director of the ACLU, think Kavanaugh has it exactly wrong. "If courts do not enforce constitutional and legislative limits on the executive branch's broad invocations of national security, the president will have a blank check to violate fundamental individual rights," Cole wrote in the New York Review of Books. Kavanaugh's final suggestion regarding separation of powers was to "Consider the possible benefits of a single, six-year presidential term." He argued that worrying about re-election is a distraction, and "makes it harder for presidents to tackle difficult but necessary issues in their first terms." So while Kavanaugh stresses accountability for everyone else, he argues for removing any form of presidential accountability other than impeachment. The only real chink in Kavanaugh's unitary-theory armor is that he seems to adhere to it more in theory than in practice -- and doesn't appear to feel nearly so strongly about absolute executive power when the president is a Democrat. For instance, he acknowledged in his 2008 article that "the nation certainly would have been better off if President Clinton could have focused on Osama bin Laden without being distracted by the Paula Jones sexual harassment case and its criminal investigation offshoots." 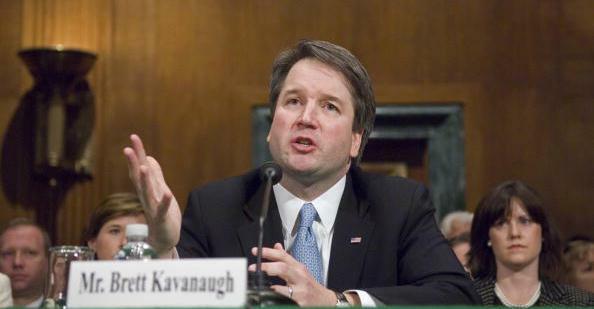 At the March 2016 AEI event, Kavanaugh was asked to opine on Republican Senate leader Mitch McConnell's vow not to give Obama Supreme Court nominee Merrick Garland a hearing — ever. Kavanaugh, who had written that presidents deserve to have their nominees given a vote in a reasonable amount of time, hemmed and hawed. "Obviously, questions about the process of what's going on and the direction of the Supreme Court and what role judicial philosophy should play in the confirmation process, are really above my paygrade," he said. "And thus I can't comment on how that should all proceed, nor would I know what to say about how all that shall proceed given the different circumstances. That's not my role." He explained that "what I believe is that the rules of the road should be set in advance… so we don't have the situation we're in." But Senate minority leader Chuck Schumer told the New York Times earlier this month: "This issue, I think, will affect a lot of people who are sort of O.K. with Trump but think there needs to be a check and balance." He continued: "There are a lot of people in America who still say, `I voted for him, I guess he's O.K.' But when you ask them, Does he need a check and balance?,' they say, 'Definitely.' "
Gene Healey, vice president of the libertarian Cato Institute, wrote in the American Conservative in January about Trump's erratic behavior and low impulse control. He wondered what Congress – or anyone else – could do if Trump pardons himself, or nukes North Korea. And he noted that in Obama's "last year alone, U.S. forces dropped over 26,000 bombs on seven different countries. Trump blew past that tally nine months into his tenure." The presidency, Healey noted, "never seems to get any smaller or less menacing. But if there's ever going to be a 'teachable moment' on the dangers of concentrating too much power in the executive branch, it ought to be now."